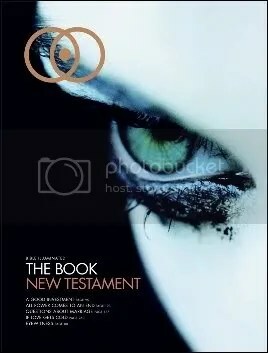 I was intrigued by a post over on Jonny Baker’s blog about a glossy magazine version of the bible. I ordered it weeks ago but missed the post and had no way of collecting it from the sorting office until the wonderful wife went and picked it up on her way home from work. I was originally sceptical about how well the full new testament would work as a magazine. Magazines tend to be short and to the point with small articles. I envisaged vast amounts of text printed on floppy pages with a couple of pictures here or there. Instead I found something that looks visually stunning. It actually feels like it needs to be read. It is wonderful! The images are thought provoking and linked with some key passages from the text. There are many wonderful contemporary depictions of familiar scenes such as the birth of Jesus. This is clearly not a Bible you are going to want to sit down and read verse for verse with a commentary. That is not its purpose – there are many different study bibles out there. This serves a much more important market – those who have never read the bible before and are unlikely to do so because of the format. We live in a world where a vast majority rarely pick up a book to read. The internet and magazines are the predominant reading material – and this is who may well pick this up. As they flick through they may only glance at the occasional piece of text but as with all magazines, key verses are highlighted. I was at first worried about the durability of this visually stunning glossy mag. I was quite concerned about the £22 I had paid for it. What if it becomes less pristine? What if it looks like it has been thumbed through as though in a doctors surgery waiting room awaiting the next grubby paws to come along and leaf through it. Hopefully it will become just that. Hopefully whilst I am making a cup of tea for a couple who have come to talk about the prospect of a marriage in their local parish church they will pick it up. Hopefully they will paw through it. Hopefully they will perhaps see what I see – the hope of the world. Perhaps when it looks a little too dog eared from people finding out about Him, I will buy another one and leave it lying around where people can get their hands on it! Available from Bible Illuminated and Amazon and you can check out a sample chapter here. I have just been reading many of the thoughts of Mark Russell in the church times. Many are down to the question of rebranding the church army and the possibility of becoming a religious order to clarify the role that the Church Army has. I don’t think that the militaristic image is always helpful… but we’re not a church, and we’re not an army; we’re not a church in the army and we’re not an army in the church. …The final change Mr Russell hopes to see implemented in the organisation, is to bring all those involved in pioneer ministry into the Church Army. Many of them currently feel isolated and unsure of their relationship with the Church of England, he says. The Church Army would be a “natural home”. What do we all think of these developments? 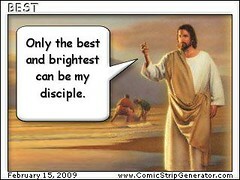 One of my flickr contacts produces these wonderfully pithy comic strips. They really do make you think! I find this sentiment a little bizarre.